WINSTON-SALEM, N.C.--(BUSINESS WIRE)--Krispy Kreme Doughnuts, home of the iconic Original Glazed® Doughnut, is exciting fans’ taste buds with an all-new flavor experience – the Blueberry Glaze Doughnut. 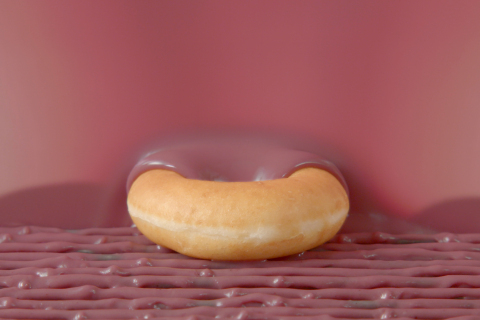 The new one-of-a-kind glaze flavor, will make its debut Monday, May 21 and be available for one week only through Sunday, May 27 at participating Krispy Kreme shops across the United States and Canada. From the same Krispy Kreme culinary innovation team that brought consumers the delicious Lemon Glaze Doughnut in April, the all-new Blueberry Glaze Doughnut features a mouth-watering blueberry glaze, making it a fresh seasonal take on the classic Original Glazed Doughnut. The one-of-a-kind Blueberry Glaze Doughnut will be available only at participating Krispy Kreme shops for one week, while supplies last. Visit www.krispykreme.com/Blueberry to find a participating shop near you and be sure to show how you’re celebrating the start of summer with the Blueberry Glaze Doughnut by using #BlueberryGlaze and tagging @krispykreme on social.